Be Your Best Under Pressure! Learn how elite athletes like Michael Jordan, Sandy Cofax, Tom Glavin, and Pedro Martinez, deal with pressure. In his 15 years as a major league pitching coach, with "Moneyball" Oakland A&apos;s, NY Mets, Milwaukee Brewers and Baltimore Orioles, Rick Peterson has coached Hall of Famers, Cy Young winners, and many other elite athletes. In this book, he and bestselling author and leadership expert, Judd Hoekstra make this skill available to everyone. 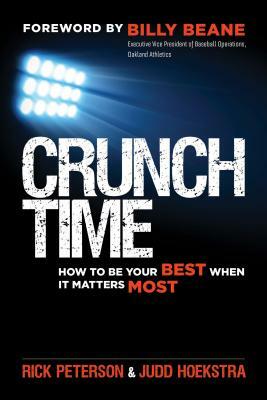 From an insider&apos;s perspective, learn how you too can become a Crunch Time performer and perform your best in all situations. With fascinating behind-the-scenes examples from some of the top names in sports and business, Rick and Judd offer six powerful reframing strategies to help you see a pressure situation with a new perspective so that it shifts from a threat that can make you panic to an opportunity for you to shine. With a Forward by "Money Ball”, Billy Beane, EVP, Oakland Athletics. Rick Peterson is one of the most successful coaches in professional sports and has a unique ability to empower others to perform at their best. Judd Hoekstra is a bestselling author, a vice president at The Ken Blanchard Companies, and an expert in making concepts universal and accessible. Billy Beane is Executive Vice President of Baseball Operations for the Oakland Athletics. He has been with the organization since 1993. 2017 Silver Nautilus Award Winner in the Psychology category. “I love Rick’s progressive and out-of-the-box thinking. He helped me improve as a major league pitcher at the back end of my career in the pressure cooker of New York with the Mets. In Crunch Time, Rick and Judd provide a GPS for you to perform your best under pressure. —Yogesh Madhvani, CEO, SimplexDiam, Inc.
“Crunch Time: How to Be Your Best When It Matters Most” by Rick Peterson and Judd Hoekstra (Berrett-Koehler Publishers, $19.95). Peterson, who coached some of baseball’s best pitchers, and Hoekstra, a VP at the Ken Blanchard Companies, combine their knowledge to show how managers and employees can reframe high-pressure situations into less stressful ones that create opportunities to shine. To set the stage, let’s take a drive. You hop into the car and tune the radio to a preset station. It’s playing one of your favorite songs; you sing along and may even turn up the volume; negative thoughts disappear. The next song isn’t one you like. What do you do? Change stations because the song evoked a negative thought and also a positive reaction. You reframed the situation. At work, you can feel pressure because you believe that you have little control over the situation, you don’t think you can handle it, or you’re thinking about the consequences of failure. In these cases, your woe-is-me approach means you’re playing not to lose. That’s a game you can’t win because the negatives create a reflexive bias on your approach to the task. By dumbing-down your ability, you become “your own worst coach”. The “Conscious Thinker” focuses on what can be controlled. Doing so creates confidence in the ability to explore and ‘grade’ options, and complete the task. This playing-to-win mindset sees problems as opportunities to showcase skills and shows that skills can be relied upon to produce results. To think consciously, slow things down. Before jumping into a high-pressure tasks, ask yourself about the assumptions you’re making about the situation and its possible outcomes. Filter out the negative ones by remembering that you’ve face similar situations and won. Key takeaway: Thoughts drive actions.